We wanted to bring to your attention a matter of great concern effecting your employees. As The New York Times recently reported, Smile Mask Syndrome is a serious psychological disorder in which subjects develop depression and physical illness as a result of prolonged unnatural smiling. This is most commonly found in individuals working in the service and retail industry. As Director of HR we assume you would want to prevent any such disorders affecting your employees. We think you will be interested to hear that we produce the world’s only medically certified smile replacement mask. We have used them at our gatherings so people can’t be sad. Additionally Dr. Senut Gib of Uppsala University recently published a paper in the Journal of Scientific and Industrial Research showing how our product reduced Smile Mask Syndrome by up to 48.4%. 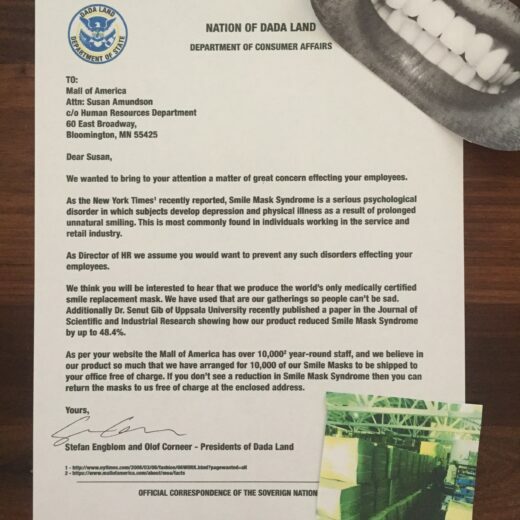 As per your website the Mall of America has over 10,000 year-round staff, and we believe in our product so much that we have arranged for 10,000 of our Smile Masks to be shipped to your office free of charge. If you don’t see a reduction in Smile Mask Syndrome then you can return the masks to us free of charge at the enclosed address.